(left) Ekin Cheng, and (right) Shu Qi and Aaron Kwok in The Storm Riders. The Skinny: Elaborately told fantasy spectacle that succeeds as hollow entertainment for the thirsty masses. The special effects alone should shape the future of Hong Kong Cinema for years to come. Without a doubt the most eagerly anticipated flick in recent HK history, this adaptation of Ma Wing Shing’s popular comic book Fung Wan is a solidly entertaining, if somewhat hollow spectacle. Boasting the best special effects ever seen in a HK flick, this two-hour martial arts and swordplay extravaganza is basically a Zu: Warriors for the new millennium, or an HK version of Star Wars. This is an old-fashioned wuxia reframed with modern storytelling techniques. Fung Wan manages to take us to another world, which is one of the things that movies - when they’re not engaging our hearts and minds- should do. Plot: Lord Conquer (Sonny Chiba) is the leader of the Conqueror’s Clan, and seeks supremacy in the World of Martial Arts. Prophet Mud Buddha (Lai Yiu-Cheung) tells Lord Conquer his future prosperity is dependent on two young children, Wind and Cloud, and promises to reveal more in ten years time. Conquer conducts a search for the two children - and in order to retain them he murders their parents. Ten years later, the two have grown into the chief lieutenants of Conqueror’s Clan. 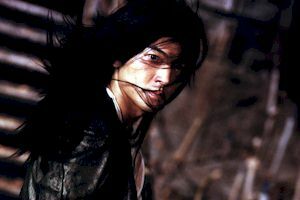 Wind (Ekin Cheng) is a kind warrior who possesses the powerful “Wind Kicks.” Cloud (Aaron Kwok) is a brooding introvert whose “Cloud Palms” allow him to utilize liquid as a weapon. Lord Conquer seeks to find Mud Buddha again to reveal the second half of his initial prophecy. It’s only then that Lord Conquer discovers that destiny provides for Wind and Cloud to make him - and break him. Conquer pits the two versus one another via his daughter, Charity (Kristy Yeung), who just so happens to like both our Canto-pop stars. But as destiny would have it, Lord Conquer’s plan to do in his two disciples goes wrong, and before too long he must contend with both of them. “Cloud is unpredictable. Wind is formless.” This line from the film pretty well describes the acting. Aaron Kwok fares the best, showing intensity and a physical presence necessary for his role as Cloud. Ekin Cheng is exceptionally bland - his acting limits are extremely apparent next to Kwok. The guy just isn’t a proper wuxia hero. It’s no wonder that Chastity was fooling around with Cloud behind Wind’s back. Support is varied, but the numerous cameos and big-name supporting parts make up for any fault in the lead casting. Especially notable are Anthony Wong as Sword Saint, Alex Fong as Whispering Prince, and Roy Cheung in an against-type role as a Shaolin monk. Shu Qi shows up as Muse, official love interest, and she’s as winning as ever. Towering over everyone is Japanese actor Sonny Chiba (The Street Fighter), who hams it up relentlessly as the power-mad Lord Conquer. Andrew Lau and Manfred Wong do a decent job of providing summer movie fun. On the negative side, the plot is terribly convoluted and there are far too many characters. Knowledge of the comic book would probably be helpful as much of the film is guaranteed to lose the casual viewer. The much-vaunted SFX are impressive by HK standards, though they’re nothing compared to your average U.S. blockbuster. The film leans a bit too much on the effects, perhaps expecting them to carry the film where good choreography usually should. That approach yields an almost soulless product - you can practically see the potential for a Happy Meal promotion.